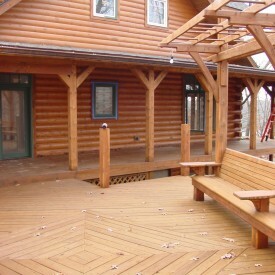 At 888-LOG-GUYS, we know how to restore and refinish your log home or log cabin to make it like new again. We also know how to do a few other things, too. We can repair your log home. We can seal your log home. We can improve your log home. We can maintain your log home. It’s intriguing, isn’t it, all of the things we can do to provide you the best service in log home care in the Montgomery AL area. No matter what your log home needs, our company will do the best work for the best price. Call our number, or ask for a quote online! 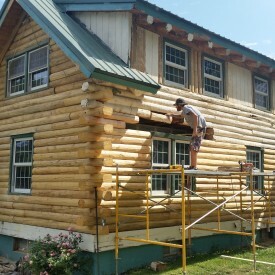 Our professional crew is spot on with log home restoration. Our process can be tailored to your unique home. It starts with surface preparation (media blasting or chemical stripping) to strip off the old stain or worn out color before sanding the logs for a smooth finish. Next, we use a borate treatment to clean the logs. Lastly, we apply the best stain product to give your home the “as good as new” look. 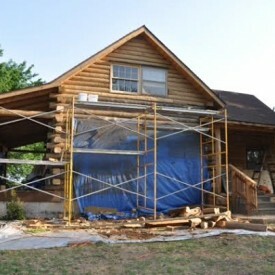 You will love how our guys will rejuvenate your log home in the Montgomery Alabama area! 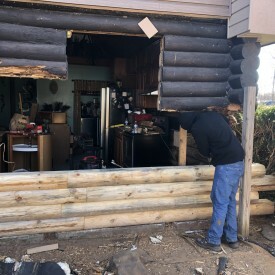 If you are experiencing log rot, logs damaged from severe weather, or logs infested with bugs or insects, then call 888-LOG-GUYS to fix your log home and bring it back to excellent condition. Our work is guaranteed to satisfy! If we don’t, we will continue to work until you are beyond satisfied. We want you to feel like your log home is safe and secure. Don’t procrastinate your log home care! Contact us by phone or online today! Keep your log home or log cabin a cozy and comfortable place! Ask 888-LOG-GUYS to apply the best energy seal products on your log home or log cabin. If you already have a chinking or caulking product applied on your log home, then we can repair it as well. A properly-applied energy seal will keep water leaks, air drafts, and invading insects from coming into your home. Make sure the spaces in between your logs are sealed! Call us today, or fill in an estimate request on our website! Is there something you would like to change about your log home? Are there any additions you would like to build or construct? 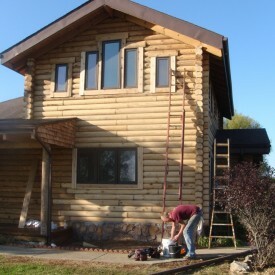 Our professional crew will transform your log home or log cabin to make it seem more beautiful than it already is. We have experience in building decks, porches, and patios. We know how to construct log railings and log staircases. If you have other ideas in mind, then let us know! We are here to help you make YOUR log home dreams come true! Without proper protection, a log home is easily susceptible to damage from nature’s elements. 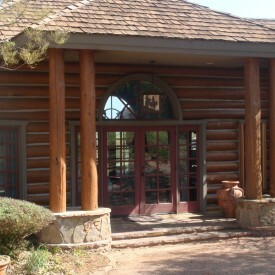 Use 888-LOG-GUYS, the #1 log home maintenance company, to preserve your log home or log cabin. With a basic wash and top coat application every 4-5 years, your logs will never get old, worn down, or weathered. We stand by our work, and we will take responsibility to make sure your log home is always given the best log home care in the Montgomery Alabama area. Send us an estimate request online, or give us a call today!